This morning, husband spotted a very large, very handsome yellow and brown moth on the city-supplied black trash container, nestled into a depression that runs on the back side of it. After looking into a couple of books (whose pictures showed this species with different markings--it's variable) I found it on BugGuide.net There's not a record of it for this county, so I uploaded an image to Butterflies and Moths of North America, the big lepidoptera database. The regional expert for our area will confirm or deny my ID (but it's pretty darned obvious, this moth) and then it will become a data point. Here's a big image of it. It's still where it was in the morning. According to what I read, it probably emerged last night--shortly before dawn--and will fly tonight to mate. I hope it finds another one and we see more of these around. 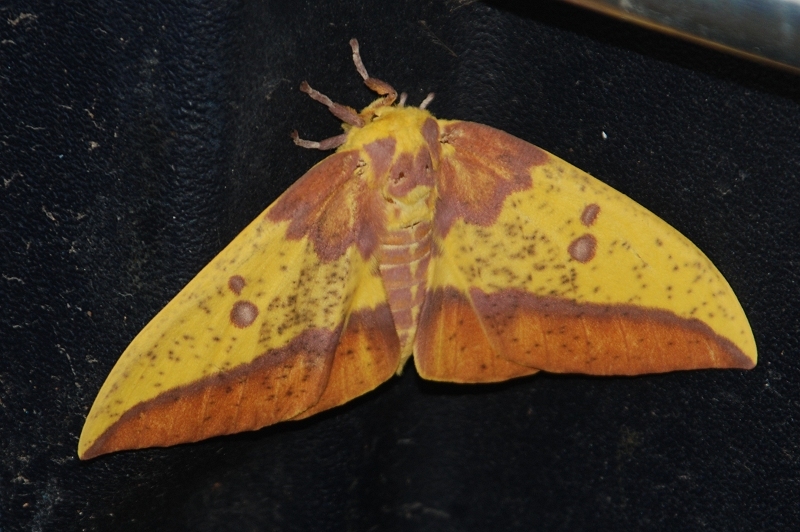 Sorry--though the name is distinctive and a single Google will get you _Eacles imperialis_, I'll add it to the title. That's a fascinating critter -- and it's neat to know about the website; I have a distant relative I'll report, if I ever catch it on camera. What gorgeous colours. I've seen similar moths here in Australia, but in browns. That is a real beauty. I so love butterflies and moths - they are a symbol of the Resurrection! And I have needed that so badly this year.